Today the "Electron" of August 2013 arrived. 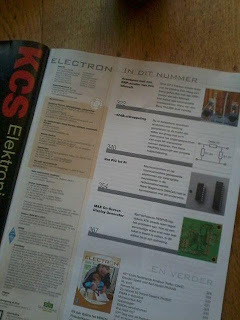 The "Electron" is a Dutch magazine for ham's. Always a joy to read it. This time the magazine contains following interesting articles: Build a videogenerator, set-up of a medium wave AM broadcast transmitter, minicomputers (Arduino, Rasberry Pi, PICs) for radio amateurs and a simple interface for spectrum analisers.